Increasingly, aesthetics are being considered alongside effective performance and ergonomics when engineering products/equipment are being introduced to the market, according to Moor Instruments of Axminster. Moor Instruments specialises in the design, manufacture and distribution of laser Doppler systems used for the measurement of blood flow in the microvasculature. 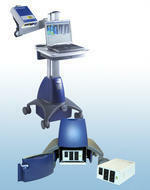 Typically these are trolley mounted and principally comprise an arm-mounted imaging system and either an industrial PC or laptop computer. Power for the equipment is delivered via an isolation transformer that must comply with European Medical Devices Directive EN 60601 Parts 1-1-2 and 1-1/A2 which cover electromagnetic compatibility and general safety, respectively. Also, because Moor sells worldwide, the transformer must conform to UL 2601 – Medical Equipment Part 1 and CSA 22.2 NO.601.1 Medical Equipment, Part 1 UL File No. E304665, for the North and South American markets. The company has recently introduced two new models, the moorDLS and moorFLPI to offer its customers, principally in medical research but increasingly for clinical areas, that are more compact and easier to manoeuvre in confined spaces. These new units are based upon a commercially available trolley that is more compact, easier to manoeuvre and visually more pleasing than the previous custom-built ones built for the company. To facilitate this change, the company needed to find an equally available off-the-shelf transformer that meets the required medical standards. The solution was the REOMED from REO UK. This totally self-contained, fully-enclosed unit provided a number of bonuses for Moor. According to Martin Potter, Development Engineer at Moor Instruments, “It’s compact, so it fits neatly into the base of the trolley. It requires no special wiring – unlike the previous transformer, which in turn ensures product consistency/reliability. It is also available in different voltages in the same size enclosure, so no modifications are needed to the trolley for different overseas markets.” He also added that it would not look out of place on a desk for desktop applications and that the REOMED has a number of IEC socket outlets, enough for both standard applications with scope for adding customer-specific peripherals (external hard disks, printers etc.). Isolating transformers help reduce electric shock hazards and limit the risk to sensitive monitoring equipment of interference generated on the mains distribution network. REO’s REOMED transformers are based on toroidal-core construction, and offer many benefits including low-leakage current, high dielectric strength, low electromagnetic stray fields and a very low value of primary-to-secondary capacitance. REOMED transformers also provide an additional benefit in that they protect essential electrical equipment connected to their secondary side against an earth single-fault condition by ensuring that power is maintained to the essential equipment. By using isolation tape and a screen winding between the primary and secondary windings the required dielectric strength of ≥ 4kV for reinforced and double insulation is achieved, plus the required “general earth leakage current” of < 500 microamperes is also achieved. The compactness of the REOMED results from the cores of the transformers being constructed from electrical-grade steel strip, with a screen winding and tape isolation between the primary and secondary windings. The core is virtually air-gap free and has very low losses. Further external protection and mechanical durability is achieved by encapsulation within a plastic housing. The whole transformer - fuses, input/output sockets and mains switch - is housed within a metal enclosure designed for bench top mounting. At the moment, REO’s MDD compliant range covers standard units for 230V or 115V with power ratings of 300, 600 and 1000VA. REO also manufactures medical transformers for 3 x 400V rated for up to 8000VA and has designed special versions for building into specialist medical equipment.